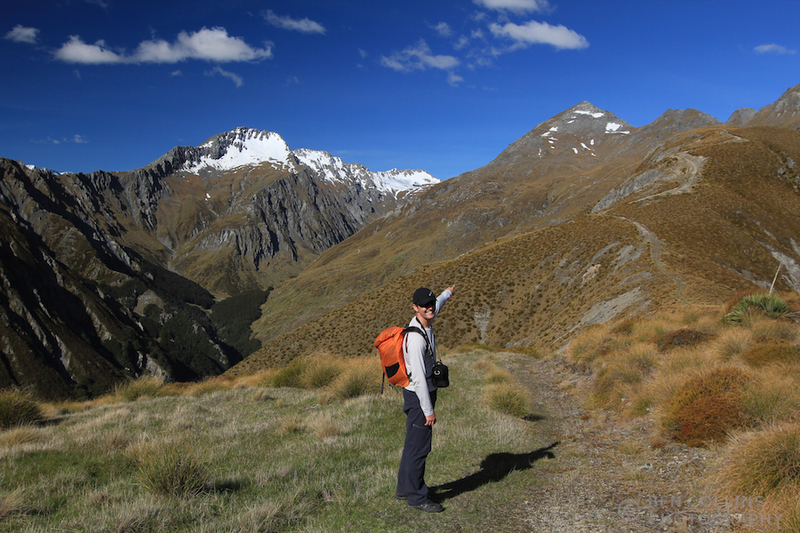 After a brief rest following our fun four day tramp along the Kepler Track, it was time to venture back out into the wilds. 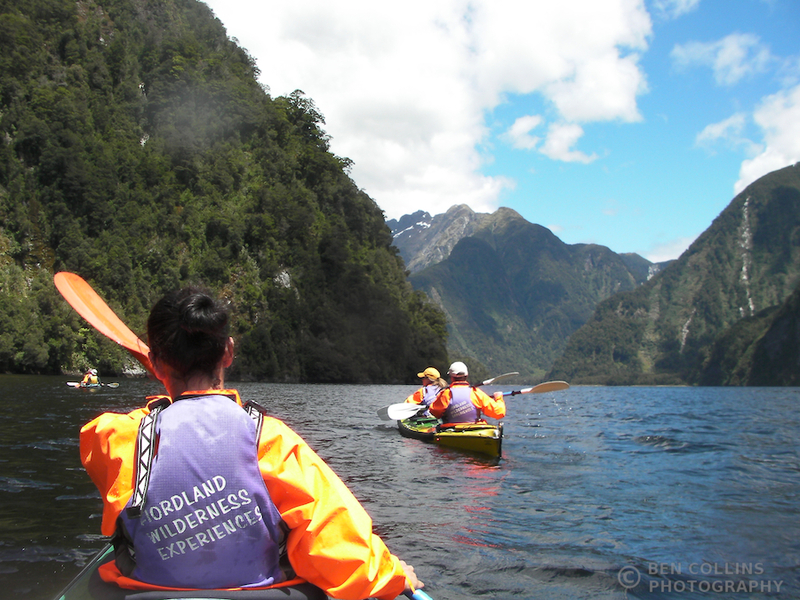 We had booked a two day kayaking tour to Doubtful Sound with Fiordland Wilderness Experience. 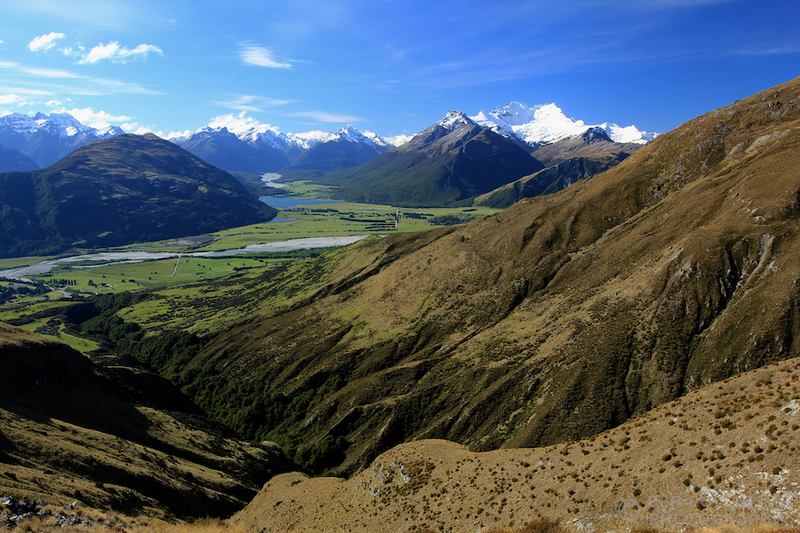 Doubtful Sound is a vast sea inlet, surrounded by mountains and not connected to the road network. To get there would be a journey in its own right. 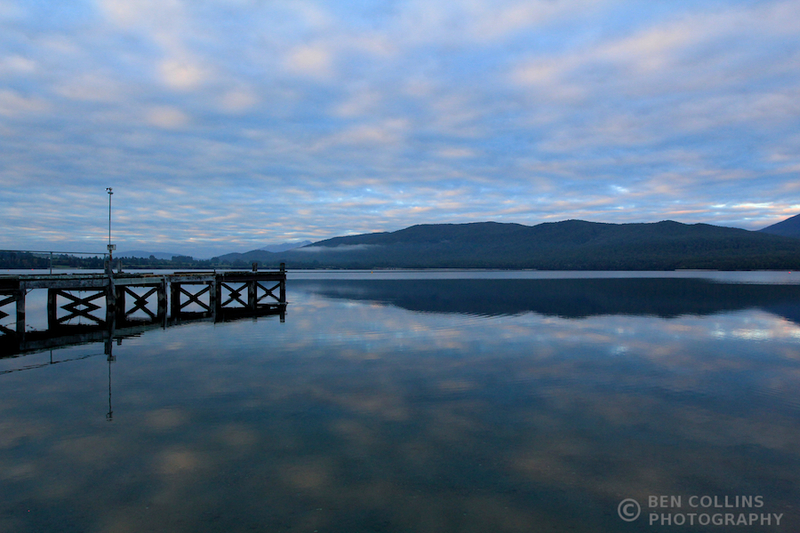 Pete & Lisa, Lexi & I were picked up by the Fiordland Wilderness team early in the morning from Te Anau, and from there we drove down to Lake Manapouri. 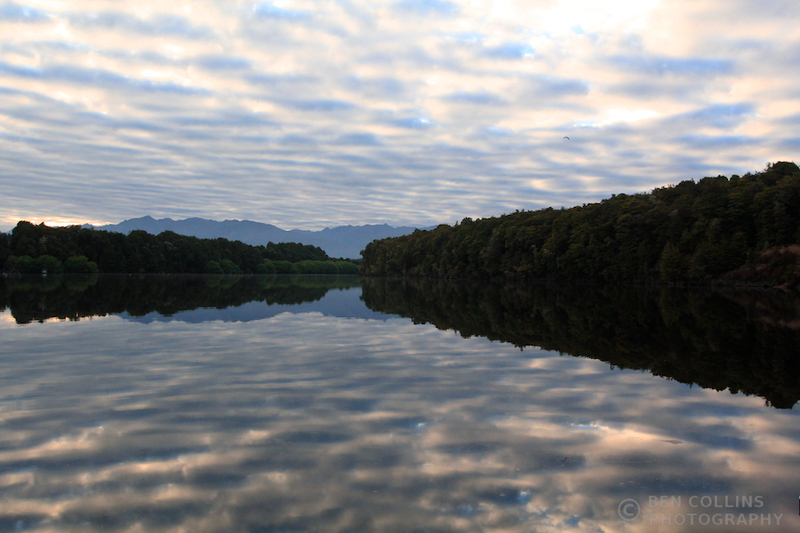 Here we hopped aboard a boat for the 45-minute crossing to the power station on the opposite side of Lake Manapouri. 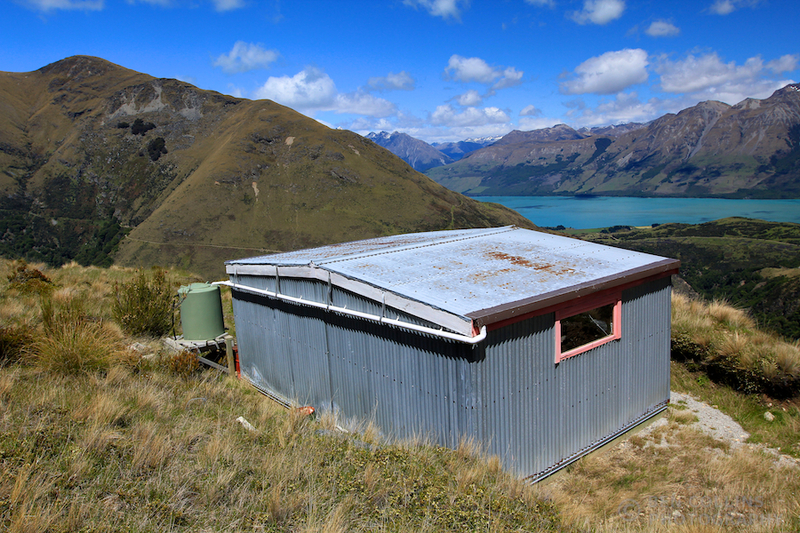 During the construction of this hydroelectric power plant, a road was built from the site across the mountains to connect it to Doubtful Sound, so creating access to the sea and a route for the heavier, larger construction materials to arrive. 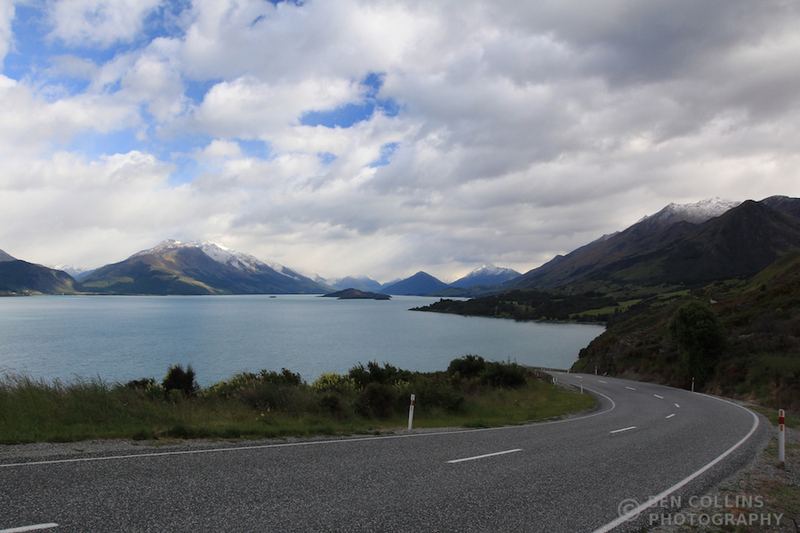 The views from the Wilmot Pass, down to Doubtful Sound, were stunning. After being tortured by the sandflies (yes, they can be bad so pack a bug headnet and bugspray!) during the safety briefing, it was sweet relief to get out on the water. We were in double kayaks that felt very stable but still easy to paddle. The sun was shining (a treat in these parts of the world), the scenery was magnificent and I was with my favourite people so what could be better? We paddled all the way to the end of Halls Arm, a truly remote spot. There was nobody else for miles around; we were surrounded by nature with our only connection to the outside world being the radio set the guides carried. 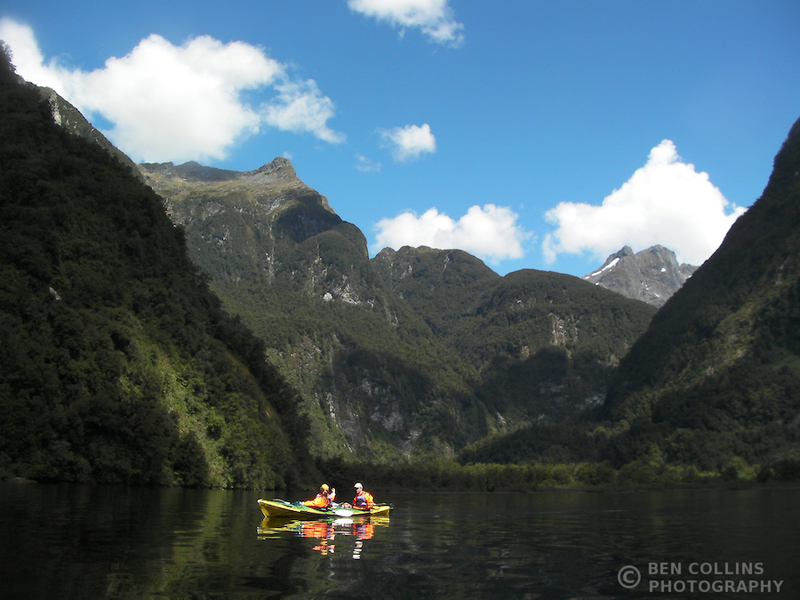 Whilst paddling we saw Fiordland Crested Penguins and a single, teasing view of a dolphin. We saw great scars on the hillsides where rock avalanches (landslips) had occurred and taken out huge swathes of trees, a reminder, if one was needed, that despite looking serene today in the sunshine, this was a constantly changing and sometimes violent place. 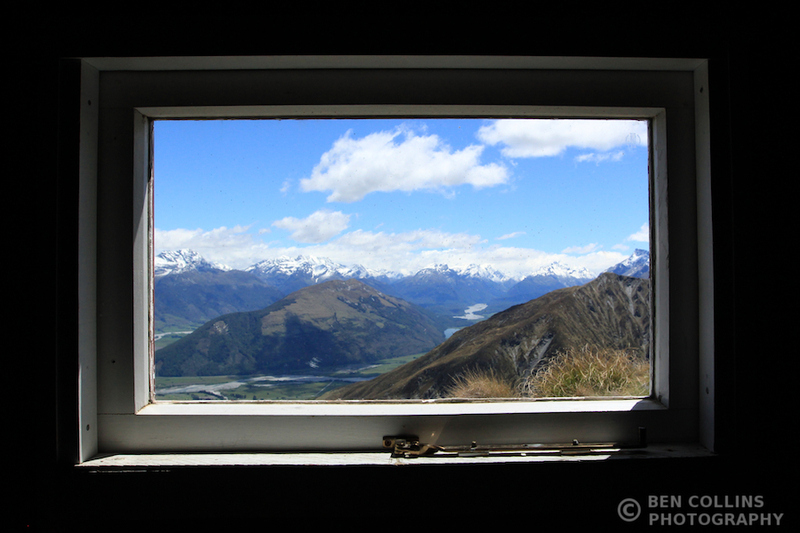 But always, always, in my mind, was the thought of how beautiful and untouched it all was. 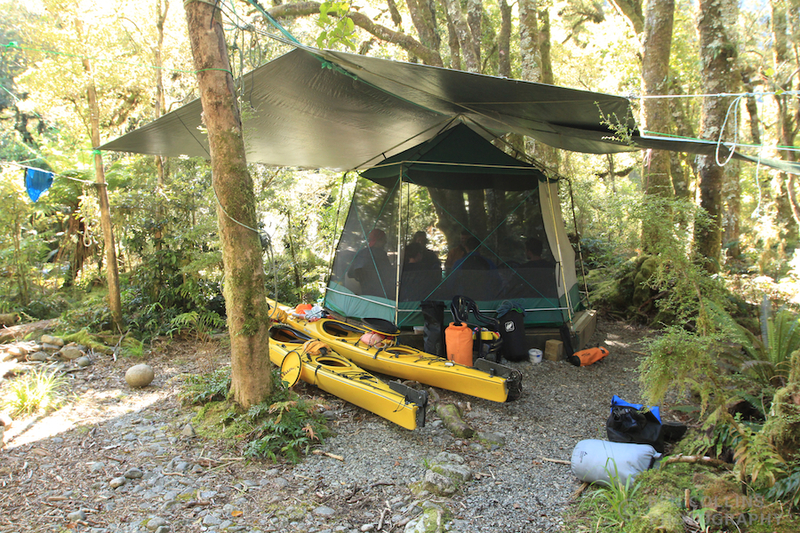 Our camp was part way along Halls Arm, on a flat area of rainforest next to a river bed. Thankfully there was a fixed mess tent (communal tent) so we could hang out and eat our dinner out of reach of the sandflies. Dinner was typical camp food, spaghetti bolognese cooked in a bag in this case, and surprisingly delicious of course, after a day of exercise and fresh air. 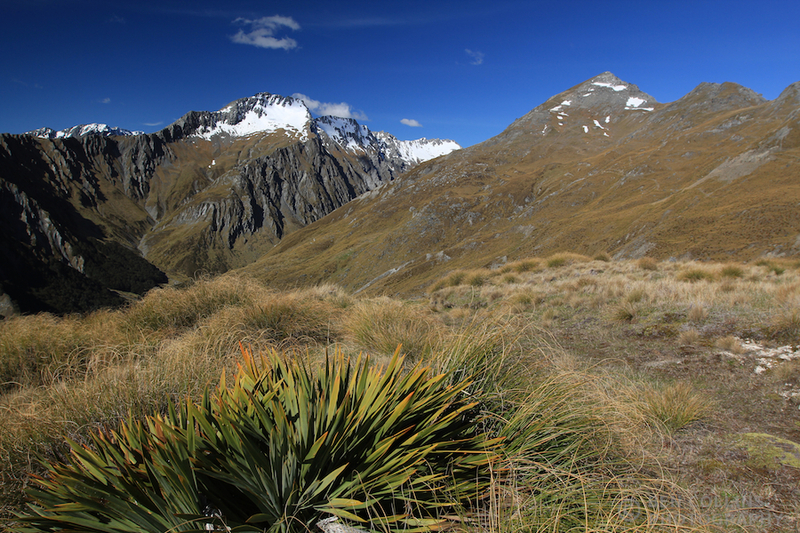 Stoats were introduced to New Zealand in the late 1800’s to help reduce the rabbit population, but since then have become a major pest themselves, a predator to the native New Zealand birds, of which some are flightless and easy prey. 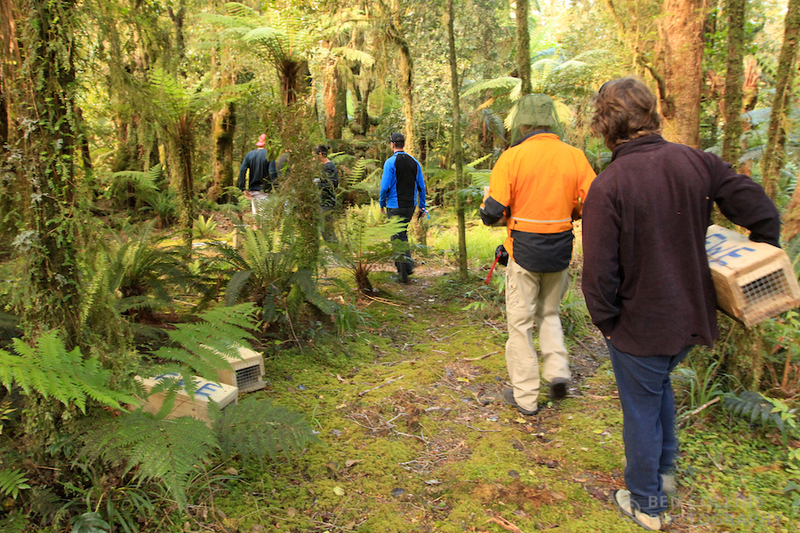 There is a major conservation drive to save the native birds from extinction by laying stoat traps in the wilds, so the kayak guides were keen to lay a line of traps behind the campsite which could be checked on a regular basis. We joined in and helped carry and set the traps. The traps are like elaborate mouse traps, with a spring loaded hammer designed to kill any stoat (or rat) that steps on the trigger plate whilst trying to reach the bait (meat and an egg). 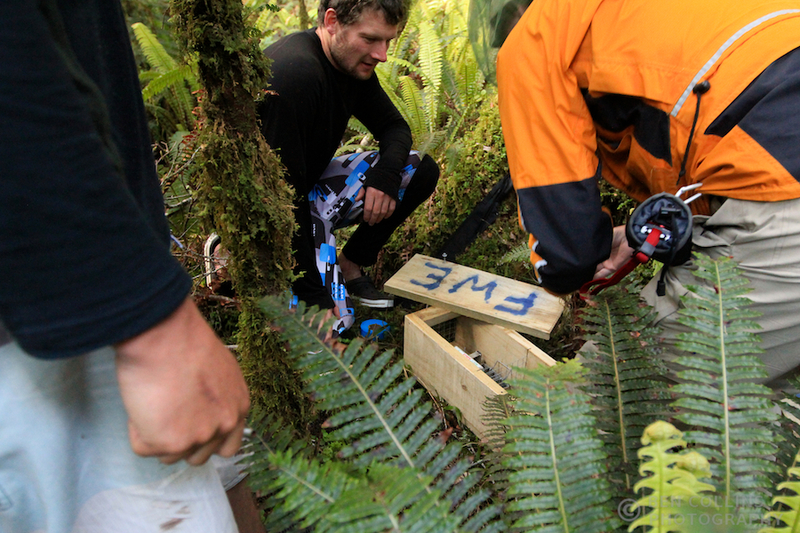 In all we laid about 20 traps in the forest behind camp, cutting a trail and marking each with GPS coordinates. 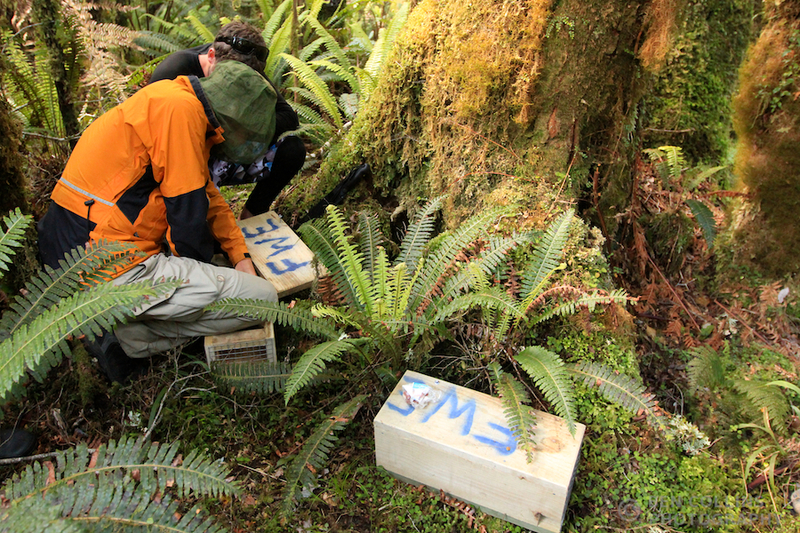 It was an interesting experience and I hope the conservation efforts are successful throughout New Zealand so the native birds have a chance to flourish again. Day 2 was a different experience altogether. Gone was the sunshine and perfect stillness, in its place was a curtain of rain and blustery winds. 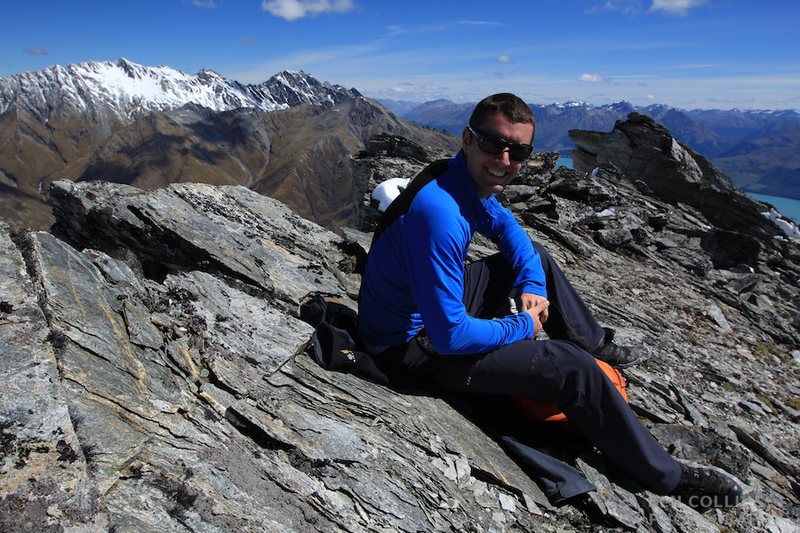 I was still in high spirits as this was our chance to see the other side of Fiordland, one of the wettest places on earth; a chance to see the real Fiordland and be humbled by it all. One has to accept nature on her terms when one goes “adventuring” after all. 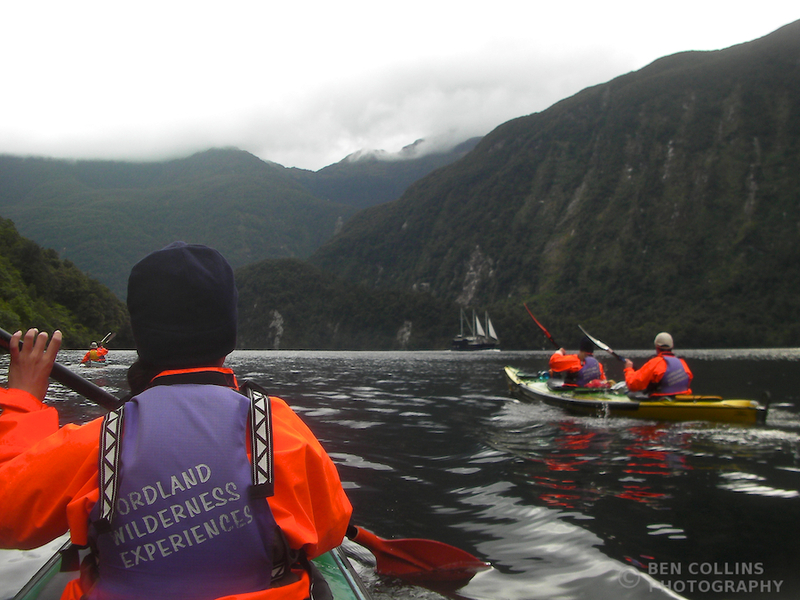 Crossing the fiord from Halls Arm was exciting as the wind blown swell tossed our little boats around; it gave us an impression of how difficult kayaking could be in rougher conditions. 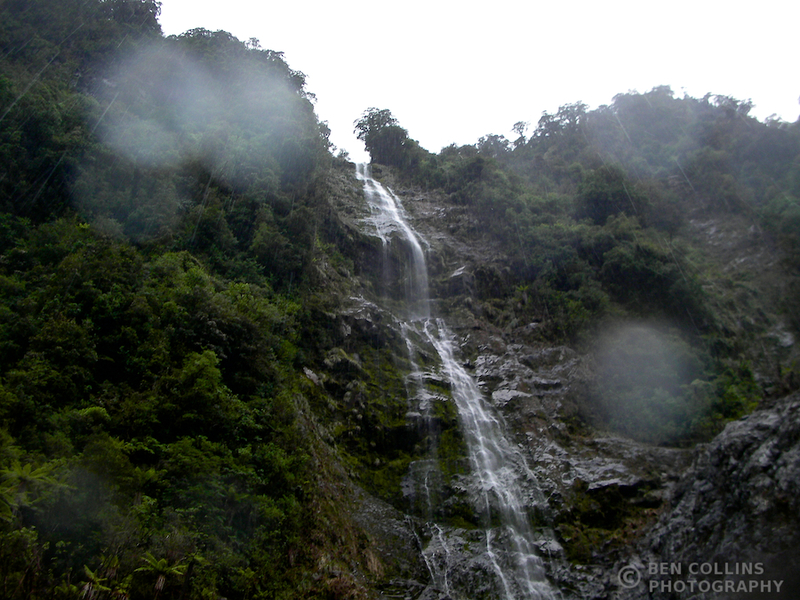 Waterfalls abounded on our second day, pouring over the cliff edges, between trees clinging to the steep walls all the way down to the water’s edge. There was no place to stop, even if we’d wanted to. 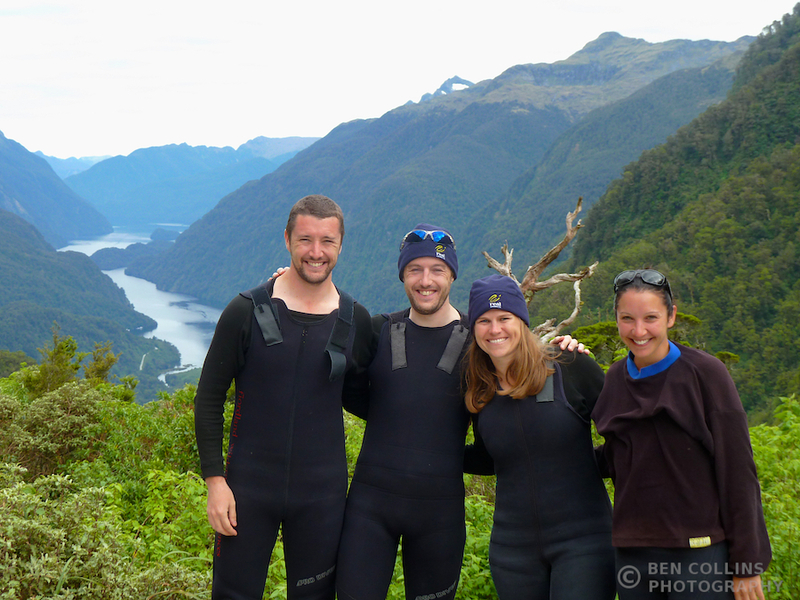 Creeping along close to the cliff edge, we paddled under low hanging branches and around fallen or submerged trees, enjoying the finer details of Doubtful Sound, our world reduced to the flora immediately around us. 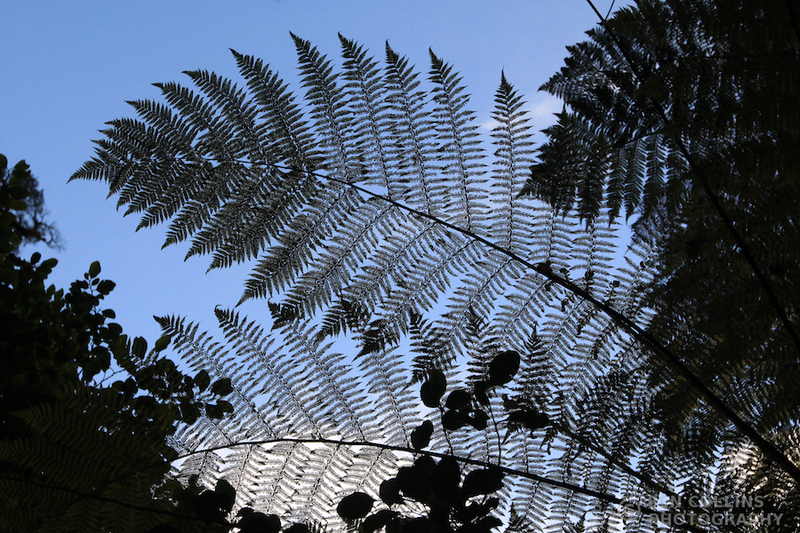 Apart from the sandflies, we didn’t see any other wildlife. Ship ahoy! 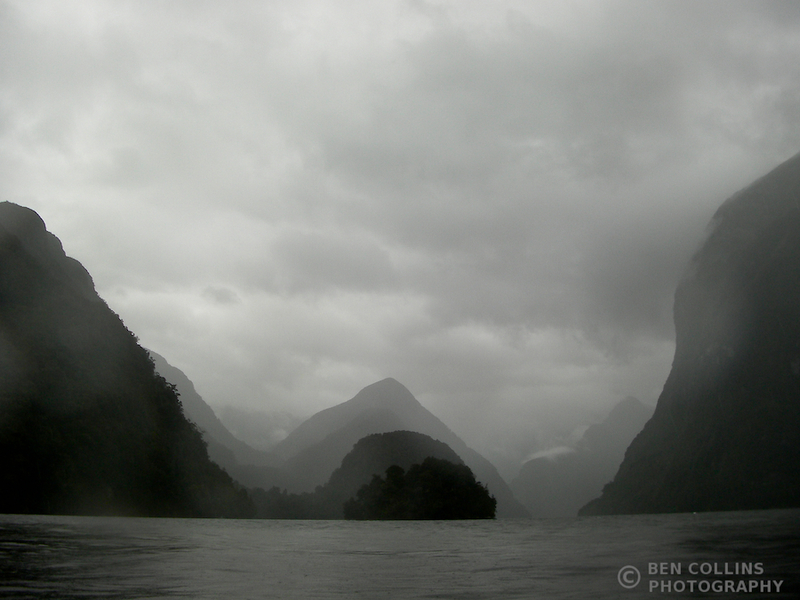 One of the few other vessels we saw in Doubtful Sound (photograph by Pete Collins). On the return leg, we had the wind on our backs so it was an enjoyable paddle back to Deep Cove. 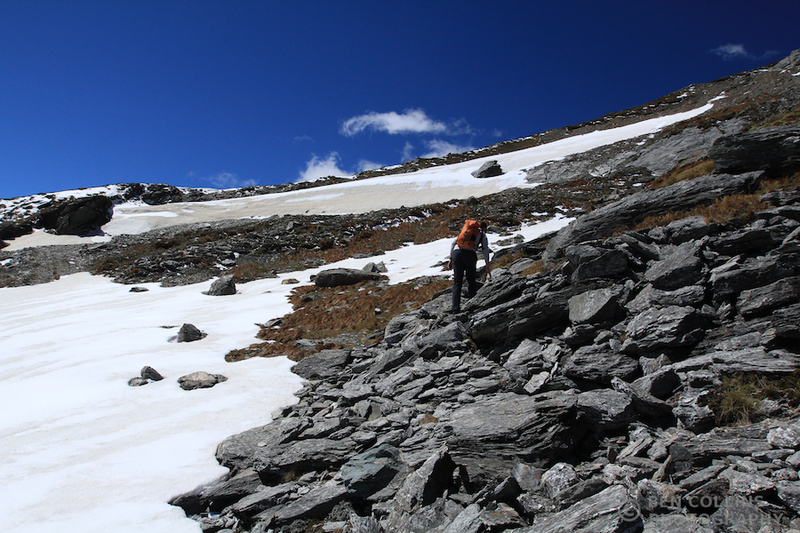 A final battle ensued with the sandflies as we packed up the gear. 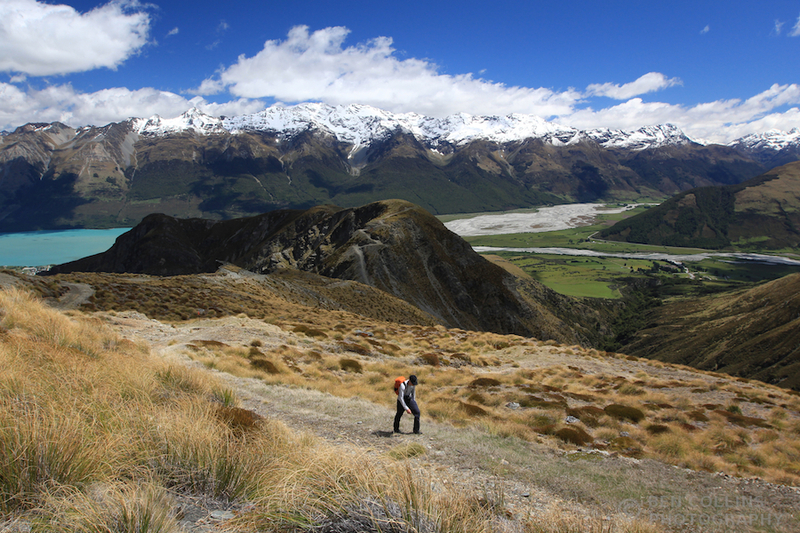 All in all, it had been a brilliant and challenging couple of days in a true wilderness. We were all glad to be free of the sandflies though – they had been driving us all to insanity – although Pete and I secretly wished the adventure was longer. 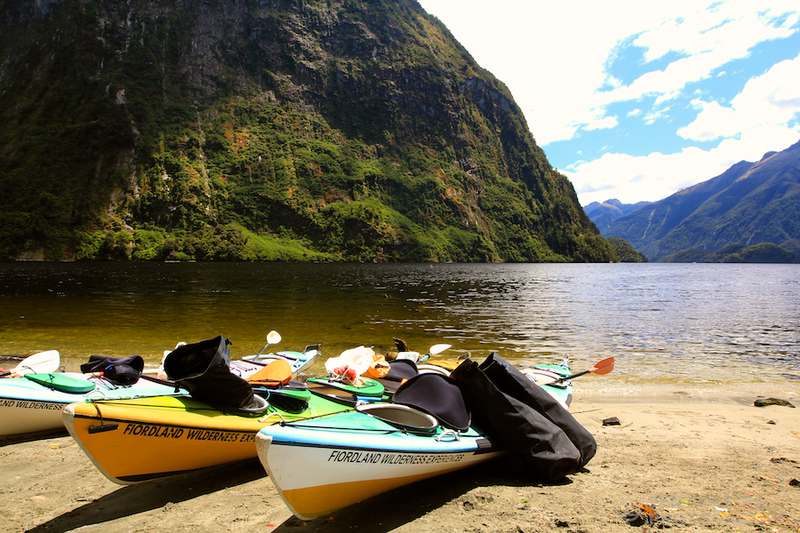 We’d have happily spent a few more days exploring the myriad of inlets and coves of Doubtful Sound. 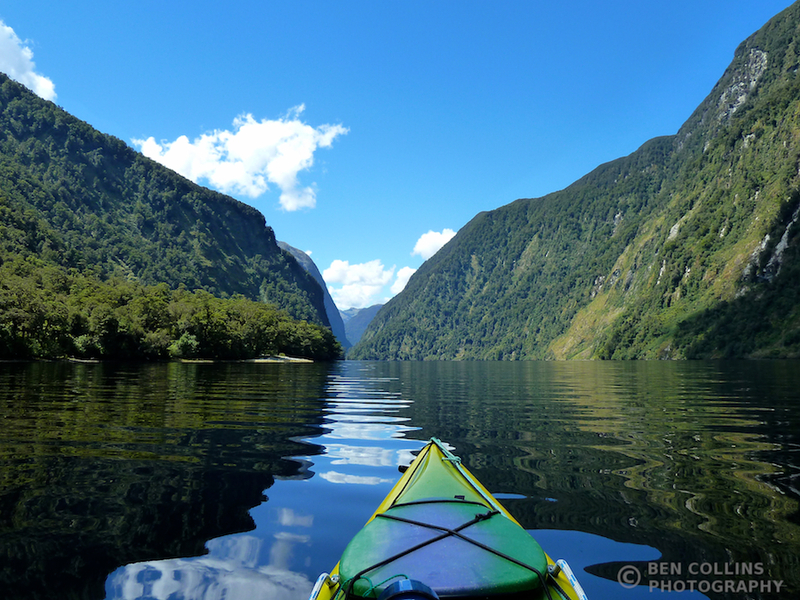 This entry was posted in Kayaking and tagged Fiordland, Kayaking, New Zealand on January 11, 2014 by benlcollins.